The kanklës have wide bottom, larger, about 705 x 270 x 350 x 150 mm, the height 40 - 50 mm. The body is four edged, same height, made from one piece. Some kanklës of 17th - 19th cc., dedicated to Þemaièiai (made specially pretty), have their bodies glued from separate parts. The thick end of the instrument is very angled, about 150 x 25 degrees, 160 x 30 degrees. The wooden string adjusters are attached just like in the first type instruments. The narrow end is cut almost 90 degrees, sometimes nicely smoothened or ends in narrowing rounded protrude (that's feature of North Western Aukðtaièiai), half circle, fish, bird's tail or some other shape ornamented protrude with a hole or a heart or some other shape through it (feature of Þemaièiai). The thick end is made very acute. At the thin end the strings are attached to the metal stick, hammered into body, or to nails (less often). Ornaments are put on the top sheet, thin end protrude, sometimes the top edges of the body. 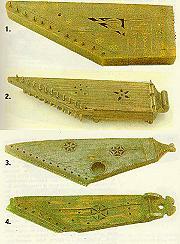 Ornaments are with taste, the same style is kept through the instrument. The top sheet resonance carvings are six leaf (four - leaf, five - leaf) star shaped, often surrounded by oval holes, distributed in the shape of a circle. Resonance holes are sometimes carved out also on the sides of the body or on its bottom. Kanklës are hung by the cut on thin end or a hole made on the thick end. Sometimes two wire rings are attached to the ends of the body and a long string is threaded for hanging it over the shoulders. The most typical are 9 - 12 string kanklës, but one could 8 - 14 or more strings. 3 - Þemaitija. The end of 18th - beginning of 19th cc. ÈDM Lt 2800. 4 - Þemaitija. The end of 18th - beginning of 19th cc. ÈDM Lt 2799 (to see the drawing).